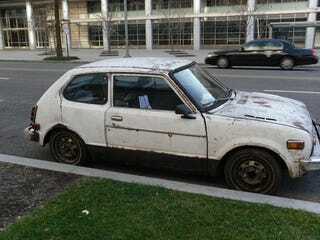 Quick announcement: Will the owner of the rust-on-white first-gen Honda Civic parked outside GM's Washington DC office please stop stalking the office staff and remove your vehicle from out front. You're sort of freaking them out. Thanks ever so kindly to the GM Washington, DC staff for sending in these two pictures of the rusted Civic they called the "Mother of all clunkers" parked out front of their office yesterday.